Have Mold Damage, Water Damage or Fire Damage? According to FloridaHealth.gov molds can grow almost anywhere there is enough moisture or high humidity, and here in the Southwest Florida communities of Cape Coral and Fort Myers, we have the perfect conditions for mold growth. Controlling moisture is the key to stopping indoor mold growth, because all molds require water to grow. Any home or business can quickly become infested with mold, especially here in sunny, humid Southwest Florida. Mold can spread throughout your property in as little as 48-72 hours, and can produce allergens and irritants that have the potential to cause other health effects. When mold is allowed to grow freely in the enclosed space of your home it increases your family’s risk of potential health problems. There are four kinds of health problems that come from exposure to mold: allergic illness, irritant effects, infection, and toxic effects. Building materials, household goods and furnishings may also be damaged. Mold needs to eat to survive, and it’s perfectly happy eating your home if you allow it. But, even if you’ve done all of the above, a leak due to bad plumbing, a faulty water heater, a leaky roof, a fire, or natural disaster such as hurricanes and heavy rains can lead to mold in your home or business. And mold is nothing to be taken lightly. Water damage is not just about removing the water. Even if the water seems to have disappeared or has been extracted, there is still the potential for issues until the structure and affected materials have been completely and thoroughly dried and remediated. So if you’ve had a water emergency, or if you think an area of your house smells musty, then call us for a mold inspection and remediation. We are a locally owned and operated company. We work for you and will help with all of the insurance paperwork as well. When you hire any company for mold related work; ask to see their certifications, licensees, insurance certificates (including workers compensation and liability, testimonials and references. Our technicians are thoroughly trained and have earned the Microbial Remediation Certification from the Indoor Air Quality Council, and they can provide the high-quality services you need when you have mold in your home or place of business. Mold remediation prevents the spread of mold by isolating damaged areas, removing affected material and eliminating moisture sources – the cause of the mold – in order to reestablish a healthy environment. Mold inspection and damage assessment—We use only state certified inspectors and remediators, who in turn use the most advanced mold inspection equipment such as moisture meters, thermal cameras, and swab tests and air quality testers to discover the source of the mold. Mold Containment—We will then close off the affected area so the mold spores will not contaminate the rest of your building. Air filtration— Specialized air filters are set up to remove mold spores from the air. Mold removal and moldy materials removal—Anything that is porous is subject to mold taking hold in it, so we will remove all affected material that is porous. Nonporous materials will be cleaned with antimicrobial cleaners. 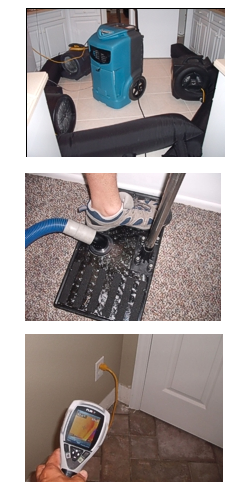 Drying and cleaning—Our professionals will clean dry out carpets and walls with professional drying equipment and then use specialized techniques and products to clean and sanitize your furniture, curtains, clothing and other restorable items affected by the mold. Repair/restoration—Now clean, mold-free materials will be used to replace what was contaminated. Testing—We follow up with another testing session to ensure the cleanup was successful. State Licensed Mold Remediator – MSR 2816. Certified Green Indoor Air Quality Specialist & Mold Remediator. Frequently hired to complete peer reviews, appraisal, mediation, & provide expert witness testimony in litigated cases.